Hinking about setting up a project studio but don't know where to start ? Want to learn valuable techniques for recording and producing music? Overdub by M-Audio takes you through the process of building your studio—from choosing the right gear to fine-tuning your current system. 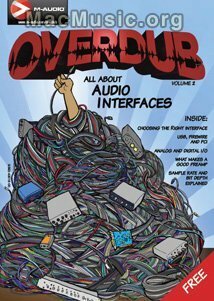 Available online or through your local retailer, Overdub covers the all the basics plus advanced tips and tricks. - What makes a good preamp? Dec 17, 2007 M-Audio announces Fast Track Ultra audio interface.